Denver, Colorado resident Collette Badger, 66, always knew that she was adopted. She felt different from her parents and had always wanted to find her birth family and to know whom she resembled. After several failed searches in archives and via court appeals, she decided a DNA test might be her only answer. Finally, her 55-year search was over. Thanks to her MyHeritage DNA test and the help of Legacy Tree Genealogists, Collette found her biological sister, Yvette, 75. Collette’s parents never hid the fact that she was adopted. They would say things like, “when we got you” instead of “when you were born.” When she was 10, Collette remembers rummaging through her parents’ belongings and finding her adoption papers. 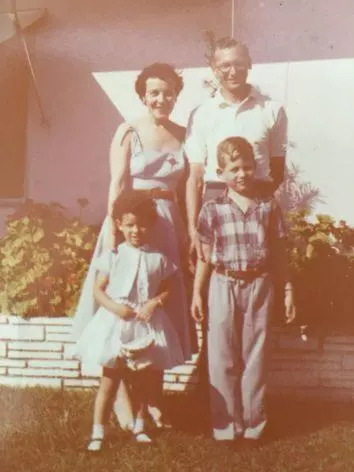 She discovered that her birth name was Noella, that she had French Canadian heritage, and at the time of her adoption, she had three older siblings, Philip, 11; Yvette, 9 1/2; and Lorraine, 7. Collette, however, never gave up. She continued searching in her 20s and then in her 40s to gain access to old records from the hospital where she was born as well as records from the original adoption agency. At 65, Collette’s good friend, Holly, proposed a new solution — MyHeritage DNA. After six weeks, the results came back and together they opened them. Collette was speechless — she had no French roots but discovered she was 80% Irish! All those years her adoptive parents had assured her she was French. Her parents named her Colette because they presumed she was French and was tutored to speak French. Throughout junior high, high school, and even college, she took classes in French. She even dreamed in French! Imagine my surprise to discover that I was almost 80% Irish! I was destroyed after learning I didn’t have any French roots. “I’m not French? Ok, what am I?” What little I did know about my heritage was now totally wrong. That’s what made me decide to find out where I came from. MyHeritage referred Collette to Legacy Tree Genealogists who offer genealogical and DNA research services. Carolyn, from the Legacy team, became Collette’s project manager. Together they defined Collette’s goal to find her birth parents and family. Just a few months later, Collette received a call from Carolyn that forever changed her life. Carolyn called to tell me she found out my mother’s full birth name — Noella St. Laurent. I cried and cried knowing that I was named for my birth mother. As the days passed, I had more and more information from Legacy Tree. 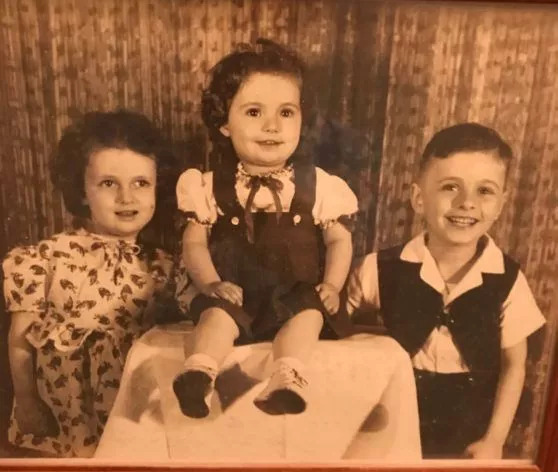 In addition to learning more about my parents, I learned that I had two siblings that were still alive. The team from Legacy Tree Genealogists found exactly what I had asked for — they found my birth family! Colette’s closest genetic match on MyHeritage shared enough DNA to be either a first cousin, half-nephew, or great-nephew. Because of the age difference, Carolyn hypothesized he was a great-nephew. Furthermore, he listed his great-grandparents as Joseph St. Laurent (1916-1989) and Noella Roy (1922-2005). Carolyn was then able to locate Noella’s obituary. Noella named her children Phillip, Yvette, and Loraine. All the names corroborated with the information from Collette’s adoption — age, location, occupation, and more. Using other genetic matches and document-based research, Carolyn helped Collette continue to build her family tree and extended her paternal and maternal ancestry back three generations to French Canada. Her ancestors migrated to French Canada from Ireland during the Great Potato Famine. Finally, the 80% Irish ethnicity received in her MyHeritage DNA results made sense. Furthermore, Carolyn had even more information about her biological family. Although her sister Loraine was deceased, Yvette and Philip were still alive. Collette waited until the time was right to reach out. She gathered her courage and made first contact with a reported niece, Lisa, and told her the story that the adoption agency had described, hoping she would pass the information onto Collette’s siblings. Lisa read me the text from the person claiming to be the baby who was supposed to have died all those years ago. Since I hadn’t told anyone about my Mom’s last pregnancy and coming home with empty arms — not my kids nor any other relatives, I knew that we were on to something. Yvette explains her surprise in finding her sister after all this time. Yvette explains that her parents were quite strict and she never questioned when they said that her baby sister “passed at birth.” She never asked and she couldn’t remember anything else that was said about the baby. Life went on. In retrospect, she always picked up that something wasn’t quite right about the situation. She couldn’t remember getting ready for the baby — crib, clothes, and diapers. She also remembers wondering why there wasn’t some kind of service or funeral. Although nothing was ever brought up again, she still sometimes found herself having thoughts pop into her head about the baby. Was she out there? As Yvette grew older and had four children of her own, she thought less and less about it. Everything changed when her niece, Lisa, got in touch to confirm her sister was, in fact, alive and ready to meet. 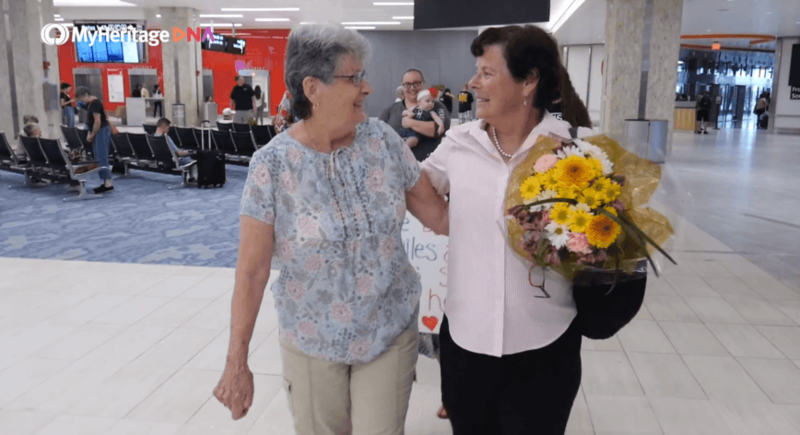 After four months of corresponding via FaceTime, Colette finally flew to Tampa Bay to meet her sister Yvette and her family. Yvette was waiting at the airport to meet her sister. The two couldn’t have been more thrilled to find each other after so many years. Both Colette and Yvette express their sincere thanks to both MyHeritage and Legacy Tree Genealogists for their wonderful work — fulfilling a 55-year dream of seeing a picture of her birth parents and meeting the sister she always hoped was there. Legacy Tree Genealogists are experienced at helping reunite families, present and past. They can help you make sense of your DNA matches and identify your unknown family members. Visit www.legacytree.com/myheritage to request a free consultation and find out about exclusive offers for MyHeritage users. These stories are so inspiring!! Not one day goes by I don’t think of the question.. “ where do I come from” I am 52 years old and was born in Korea. I was brought to the US by my biological mother and father. I was told my bio father was in the military and my bio mother.. well nothing nice was told to me. They could not care for me and I went to foster care at 2-3 yrs old. Shortly I was adopted by a permanent mother and father. Incidentally not all parents who adopt children have the child’s best interest. But that’s a entire story in itself. I sent away for my adoption records and found that California has a strict policy of protecting the biological parents identity and refused to assist me in my search. So I have literally given up. Until I was talking to my ex-mother in law who told me about DNA and how it will override legal documents. This is my last and final hope..I sent my test kit in yesterday and can hardly wait.. Thank you my heritage for this opportunity. Thanks Frances. We hope that you get some answers to your search with your MyHeritage DNA results.